Big Dreams of a very talented High School Junior learn more about her right here. You don’t have to be knifed up to get wifed up, buddy. One man in Jonesboro, Ark., thought that heroically saving his date from a knife-wielding attacker would earn him major romantic brownie points — so long as she didn’t find out he staged the entire thing himself. Jeffery Tyler Siegel, 26, and a woman told police that a man wearing all black approached them Saturday night and told Siegel, “You can go, but your girlfriend stays,” according to ABC News. The woman ran away, but Siegel said he stayed to fight. The attacker “slashed” Siegel twice with a large knife before running off into nearby woods, KAIT-TV reported. Suspicions rose when police found no trace of the suspect, even after a two-hour search. Siegel was also “reluctant” to come in for questioning on Monday, according to a Jonesboro police report obtained by KAIT. He got up so that you could get up. So Be Resurrected! There is a cleansing that takes place in Letting Go. When we fall down in our Past and roll around in our Past, people will many times see our Past before they know who we have become. Letting go is like being baptized with the Past being washed away so we can be clean and start fresh. While the Past will always be a part of YOU it doesn’t mean you have to live there or bring it with YOU. Let memories make YOU strong, but let go so YOU can grow and move on. Congratulations! Tina Turner’s engaged! Read more.. Pull out your pointe shoes and tutus ladies, Black Ballerinas are coming your way soon! In 2004, the dance world was shocked when Dance Theater of Harlem (DTH) announced they would be shutting down their touring company. The legendary ballet company, founded my Arthur Mitchell in 1969, was the first of its kind, featuring Black dancers in classical ballet roles. After years of global success, financials struggles forced the dance institution to suspend it’s company while it focused on it’s school programs, fundraising and rebuilding. Under the direction of founding member and former principal dancer, Virgina Johnson, DTH is poised to take the stage with the first official touring company since the relaunch of the Dance Theater Of Harlem Ensemble in 2008. Pop-star Rihanna isn’t bowing down… [Cue Beyonce reference]. 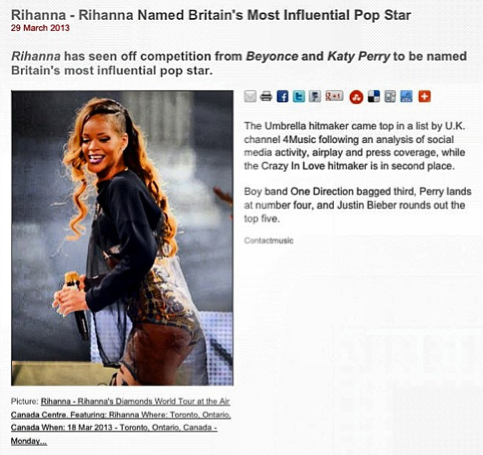 The Umbrella hitmaker is now Britain’s most influential pop-star of 2013. RiRi was crowned the Queen of the Pop Powerlist after analysts surveyed social media, press coverage, and airplay.